Frank Butrey - guitarist, composer, arranger, educator. A truly exciting presence, Frank Butrey has been stirring audiences for many years with his powerful, original compositions. Frank Butrey graduated from Edinboro University of Pennsylvania with a B.A. in Guitar Performance and Studio Teaching. He studied classical guitar under the expert tutelage of Dimitri Erdely. Frank studied jazz improvisation, composition and arranging with Basil Ronzitti, Ed Flanagan and Steve Giordano. While living in Erie, PA., he was the founder and president of the Erie Jazz Cooperative, which hosted several successful concert series. A fixture on the Erie scene, Frank led the Depot Street Jazz Quartet, performed with diverse ensembles such as 18 Strings (guitar trio), Reach (jazz quintet), and was featured as a guest soloist with Concourse, Basil Ronzitti, Bruce Johnstone, Floyd Williams, Mark Gridley, the Edinboro University and Allegheny College jazz bands, and many more. He was the first call guitarist for the Erie Philharmonic Orchestra and the Chautauqua Symphony. Butrey has backed artists such as Bobby Vinton, Englebert Humperdink, Marvin Hamlisch and others. Most notably, Mr. Butrey was the leader and chief composer/arranger for the critically acclaimed trio, Field Theory. The band included David Blaetz on bass and Rick Lopez or Matt Ferguson on drums. This dynamic trio opened for Woody Shaw, James Blood Ulmer, Suzanne Vega, Leroy Jenkins, Airto and Flora Purim, Oliver Lake, and Richie Cole. Field Theory released the recording, Life and Times, on the Lust for Toys label. They were televised in concert for the PBS station WQLN. Residing in Philadelphia since 1987, Frank co-founded the jazz trio, Triception and led the quartet, Burn Unit. He currently has an active career performing at many well-known venues, concerts, jazz festivals, private affairs and other settings. Some of the venues include; The Kimmel Center, Philadelphia, PA, the Bitter End, New York City, Trump Plaza, Atlantic City, NJ, Rutgers - Camden Center for the Arts, Camden, NJ, and the Jazz and Blues Festival in Erie, PA. Frank has worked with many noted musicians and is a member of Warren Oree and the Arpeggio Jazz Ensemble. Regular performances with Arpeggio have included television, radio, the Dominican Republic Jazz Festival, Philadelphia Museum of Art, African American Museum in Philadelphia ,PA, The Falk Theater in Tampa, Fl, West Oak Lane Jazz Festival, Cape May Jazz Festival, Small’s jazz club and the Nuyorican Poets Cafe in New York City. In addition to the Field Theory recording, Life and Times, Frank was a prominent feature on four of jazz vocalist/composer Kayle Brecher’s recordings (Choices, The Pride Inside, Urban Objects, and Spy Music). Other recordings include Malik Al Kabir’s, Giant, Truth Is by Sherry Wilson Butler and Courage by Nina Fletcher. Frank is featured as performer and composer on Warren Oree and the Arpeggio Jazz Ensembles CD’s, Lifeline and Man Bites Dog. WHAT DO THE CRITICS SAY ABOUT FRANK BUTREY? 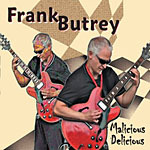 Philadelphia guitarist Frank Butrey delivers the goods on his latest outing, Malicious Delicious, a versatile platform for Butrey’s composing, arranging and especially his vigorous sometimes stinging six-string work. Butrey is truly the man, and this will be loved by any fan of not just guitar jazz, but guitar playing as a whole. Check out this disc and discover an artist who deserves to be a household name.  Butrey is doing his part in putting the electric guitar back in the jazz minds. To read the entire review click the link; Wilbert Sostre - JazzTimes (Mar 19, 2011) Review of new CD Malicious Delicious. Butrey whips up a series of intense and sometimes very personal statements that, as the title implies, shake things up and at times, provide a rich taste of more sensitive playing. Philly based guitarist Frank Butrey takes a huge bite out of the Pretzel with his dexterous breakout recording Malicious Delicious. J.Michael Harrison - host of The Bridge - WRTI Radio 90.1 FM - Philadelphia PA.
Alan Hochtkiss - KXSC, Los Angeles CA. (Feb 15, 2011) Review of Malicious Delicious. The Strength, passion, versatility and sensitivity of his playing makes him one of the most compelling guitarists around. His trio with Cliff Kellem and Tony Wyatt is spellbinding and the ensembles on the remaining cuts (Leonard Hub Hubbard, Arpeggio Jazz Ensemble, Joe Ruscitto, Tom Lowery) are stellar! Butrey's characteristic sectional writing style - unique, beautiful, and full of improvisation - is in full force on this CD - just wonderful. Long awaited and worth the wait! Butrey's guitar supplies an inexhaustible variety of sound. Deni Kasrel - The Press, Philadelphia PA.
He Stayed And Played (Frank Butrey composition), segues through changes in rhythm throughout with nice Pat Martino style guitar work by Butrey. All About Jazz musician pages are maintained by musicians, publicists and trusted members like you. Interested? Tell us why you would like to improve the Frank Butrey musician page.